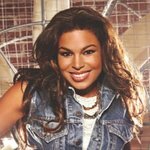 Jordin Sparks was at an event in New York on Tuesday to encourage people not to text and drive. The singer put her thumbprint on a pledge banner that is traveling around 30 cities in the US in a bid to stop car accidents caused as a result of drivers texting. Sponsored by Allstate Insurance, the event took place at the Shoreham Hotel in New York City. To find out more about the initiative and when the banner will be in a city near you, visit the ThumbsUpPledge Facebook page.